The students with whom I work are predominantly non-migrant Hmong and Mexican Americans. 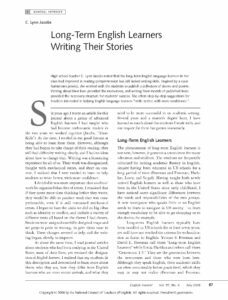 They, like other long-term English learners, know how to blend into the dominant culture, speak English well, and in many cases have adopted the same sort of “teen-speak” as their non–English learner friends. They face conflicts between the dominant culture in which they work and go to school and the home culture of their parents. Their ability to speak English places them in adult roles at a young age, as they translate for their elders. They are often expected to work after school to help support the family, and in many cases do the cooking and housework. Many have little time left to do homework, yet they are chastised by their parents when they bring home less than outstanding grades.